Mittens firmly in the 10 and 2 o’clock positions, I was driving behind a Greyhound bus one winter morning when an impatient driver turned a Celica from a side road in front of the coach, lost control on the icy shoulder, bounced off the side of the bus, and–shooting off fractured quarter panels and shattered glass–spun to a stop five metres in front of me. I realized then that I’d be better off inside the bus than behind it. 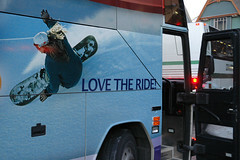 Ski-tour operators and bus companies agree. Moose Travel Network, Destination Snow, Canadian Outback, Snowclub, and even Greyhound have hit the highways with stress-free bus services to B.C. mountains. Cheap and flexible, the ski-bus trips are ideal for adventurous skiers and snowboarders–both locals and tourists–who’d rather ride than drive. Unlike the SUV driven by your mom, boyfriend, or buddy, these vehicles are steered by professional drivers. Other benefits? They’re righteously HOV, they often include movies, giveaways, and discounts, and (ahem) they’re a great way to meet new people with similar interests. “Hi, my name’s Teddy and I’m interviewing all the hot women on this bus.” I turn in my seat and realize I’m being hit on by a purple beanie bear. Attached to “Teddy” is a roving video camera and Steve, one of six rollicking Aussies who’ve chosen a Moose Travel Network cross-province trip to–as Steve puts it–“get on as many hills as I possibly can”. Moose runs backpacker-style adventure bus trips all year and–in partnership with Samesun hostels–targets its winter destinations to skiers and ‘boarders who want flexibility when they’re in the mountains. In addition to Whistler and Banff shuttles, Moose runs budget “jump-on, jump-off” bus-only and package trips to Interior mountains that are far enough from Vancouver to require overnight stays. “Okanagan Powder” visits the Kelowna area’s Silver Star and Big White resorts, “Kootenay Kruiser” drops down to the Kootenays’ Kimberley and Fernie, “Rocky Rager” adds Sunshine Village and Lake Louise to the Kootenay Kruiser, and “Big Kahuna” samples all six resorts in a 17-day loop. Like Moose, Destination Snow and Canadian Outback offer bus service to Whistler, Silver Star, Big White, and Fernie, but the similarities stop there. Destination Snow runs additional coaches to B.C.’s Apex (Penticton), Sun Peaks (Kamloops), Red Mountain (Rossland), Panorama (Invermere), and Kicking Horse (Golden) ski hills. They cater more to large student, ESL, and recreation groups than individuals, but with plenty of weekend departures and package options, the outfit will accommodate singles, couples, or small groups who want to tag along. Canadian Outback has been running year-round “soft” adventures for social, corporate, and tourist groups since 1991, and, like Destination Snow, includes Sun Peaks and Apex in its trip list. The company also welcomes singles and smaller groups to step on the bus of booked trips, and lays out lots of goodies and extras for skiers and ‘boarders who want more than a seat on a coach. Their tours are more likely, however, to appeal to the 30-plus age group that appreciates wine tastings and group brunches to beer and pizza. Closer to home, Moose Travel Network and Destination Snow run regular shuttles up to Whistler Blackcomb. This year, they’re joined by Snowclub’s “Snowbus” and Greyhound Canada’s “Whistlerbus”. Upstart Snowbus’s Web site apologizes in advance to Sea-to-Sky Highway drivers for the “awesome distraction that our very cool buses create on the road”. Stocked with movies, discounts, and 16- to 28-year-olds, the graphics-plastered Snowbus considers itself a cheap and irreverent alternative to a certain “grandmother” bus line already plying the Highway 99 corridor. After a nominal Snowclub membership fee, a “Bus ‘n’ Grind” bus-and-lift package costs $88, and a bus-only roundtrip ticket goes for $29. Snowbus’s aggressive pricing has certainly placed it on Greyhound Canada’s radar. The transportation Goliath has boosted its Whistler service with “Bus & Lift” packages that hover just above the cost of Snowbus’s, and asserts that its focus is on “trying to cater to everybody”. On the plus side, this translates into a plethora of destinations and fare concessions. Family, child, senior, student, companion, hostel, and even military discounts range from 10 to 75 percent off a regular fare, and Greyhound Canada is far-reaching enough to offer regular passage to even the most obscure ski town. The trouble is, a ski town and a ski hill are not always the same thing; getting yourself and your equipment to the foot of the chair lift can be daunting. Luckily, most B.C. mountains now charter snow shuttles from town sites to their bases. Locally, car-free Lower Mainland visitors and residents can easily access Grouse Mountain by TransLink public transit, and Cypress Mountain and Mount Seymour have shuttles running seven days a week. Skiing and snowboarding are usually considered destination-oriented activities, but throwing a routine-rocking bus trip into the mix can really add an element of adventure to the journey. Whether you’re a snow-shy local or a visiting ski bum, B.C.’s ski buses have a roomy, reclining seat waiting for you…and your mom, boyfriend, or buddy. ACCESS: Finding route, rate, and schedule information for ski buses can be tougher than searching for a ChapStick in a snow bank. Here’s a Whistler sampler to get you started; for additional destinations, rates, and discounts, visit the respective Web sites. Prices are regular adult rates, tax not included. Moose Travel Network (Vancouver area, 604-777-9905; toll-free, 1-888-244-6673; http://www.moosenetwork.com/). Bus-only Whistler shuttle starts at $43 return; on-board ski-lift tickets available for $60. Daily departures from downtown Vancouver locations. Destination Snow (Vancouver, 604-532-1088; toll-free, 1-877-507-5596; http://www.destinationsnow.com/). Bus-and-lift Whistler packages start at $92 return. Weekly departures; times and locations vary. Canadian Outback (Vancouver, 604-921-7250; toll-free, 1-800-565-8735; http://www.canadianoutback.com/). Weekend bus, lift, and hotel Whistler packages start at $219 per person. Departure times and locations vary. Snowbus (Vancouver, 604-685-7669; toll-free, 1-866-SNOWBUS; http://www.snowbus.ca/). Bus-only Whistler shuttle starts at $29 return; bus-and-lift packages start at $88 return. Daily departures from Richmond, Vancouver, and North Vancouver. Greyhound Canada (Vancouver, 604-482-8747; toll-free, 1-800-661-8747; http://www.whistlerbus.com/.) Bus-only Whistler route starts at $37 return; bus-and-lift packages start at $83 return. Daily departures from Vancouver hotels, UBC, Coquitlam and Vancouver bus depots, and others; times vary. Whistler Blackcomb Mountains, Whistler (Vancouver, 604-904-7060; toll-free, 1-888-403-4727; http://www.whistlerblackcomb.com/). Bus-only Whistler shuttle starts at $130 return. Daily departures from Vancouver Airport and Vancouver hotels. Cypress Mountain, West Vancouver (Vancouver, 604-419-7669; http://www.cypressmountain.com/). Bus-only shuttle starts at $8 one-way. Daily departures from North Vancouver’s Lonsdale Quay and Park Royal Mall. Grouse Mountain, North Vancouver (604-984-0661; http://www.grousemountain.com/). Bus-only TransLink routes #232, #236, and #247 start at $2.25 one way. Daily departure times and locations vary. Mount Seymour, North Vancouver (604-986-2261; http://www.mountseymour.com/). Bus-only shuttle starts at $6 one-way. Daily departures from North Vancouver’s Lonsdale Quay, Phibbs Exchange, and Parkgate Village. For general information, click on the “Skiing in B.C.” section of Tourism British Columbia’s Web site at http://www.hellobc.com/ or call 604-435-5622 (Vancouver) or 1-800-435-5622 (toll-free).